Hauptwerk's features allow musicians to take advantage of experiencing the most realistic sounding virtual pipe organs, high quality original instruments, and maximum adaptability to the most current as well as older computers and hardware and nearly all digital organ consoles with MIDI output. 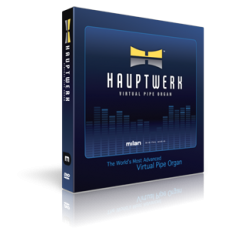 Hauptwerk is constantly being developed and improved to maintain its status as the world's most advanced virtual pipe organ. This product includes a USB dongle with a license. To download and install Hauptwerk please visit Hauptwerk Downloads. Note: Wind modelling is disabled in orders shipping to the USA.